Rabbit cages and hutches need to be cleaned regularly. It is a demanding chore, but making it a habit as often as possible will make the task less of an ordeal. By doing so, you can also keep your rabbit healthy and free from foul urine and feces odor and harmful allergens from floating around your home. Cleaning rabbit cages is easy to do. There are no strict procedures for how to clean and maintain them, and the frequency of your chore is usually based on the size of the cage and how well your bunny is litter trained. Normally, a meticulous cleaning of rabbit's cage is done on a weekly basis. This is good enough to safeguard the health of your rabbit and prevent the spread of diseases. However, if you prefer cleaning the rabbit cage or hutch everyday, the better and healthier your bunny will become. Start by removing any organic, stale and uneaten foods like veggies and greens from the cage. Wash and dry the rabbit food bowl and replace with fresh food. Make sure you have a hay rack set up too. This accessory can help a lot in removing hay from the floor of the rabbit cage. Don’t hesitate to scoop and clean the litter box when necessary. 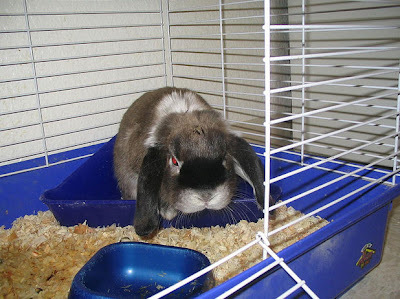 Droppings are the main source of foul odor in rabbit cages. Choosing the right cage is also important. A spacious rabbit cage made from quality metal is excellent but look for one that is easy to clean. Rabbit cages with exposed wood surfaces soak up urine and feces and are very tedious to clean. Similarly, your rabbit’s litter box should be inspected daily. This is a very important task because it gives you a chance to check your rabbit's urine and poop to ensure there aren't any changes that could specify health issues. Buying the right type of litterbox is equally essential for a successful daily cleaning routine. If you use a shallow layer of litter, cleaning out the litter box everyday is recommended. But you still have the option to to use a bit more and change it less frequently. Even with deeper litter, it’s advised to change the rabbit litter every 3-5 days. Many experts recommend the use vinegar as cleaning agent for litter boxes. It is effective in dissolving the calcium deposits resulting from rabbit urine. Put some vinegar in a spray bottle for daily cleaning of litter pans and to spray down soiled parts of the rabbit cage. If your litterbox has more nasty deposits, simple soak them with vinegar for about 20 minutes and you should be able to get rid of them easily. Andrei Smith writes for Midwest Homes 4 Pets, a company that offers a huge selection of quality rabbit cages and other affordable pet products such as bird cages and dog kennels. For more details, please visit MidwestHomes4Pets.com or contact the Toll Free Helpline: (800) 428-8560.